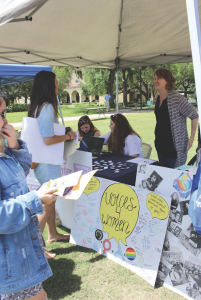 Rollins held its fourth-annual Rally Against Violence which encouraged students and faculty to stand in solidarity with survivors of sexual assault, not just at the rally, but always. It featured a local survivor of domestic violence and abuse. The rally, which has been an ongoing project of Title IX Coordinator Oriana Jimenez, took place on Mills Lawn and brought together the voices of many different departments and organizations on campus, creating a space for the support of survivors of sexual assault and for the education of allies. 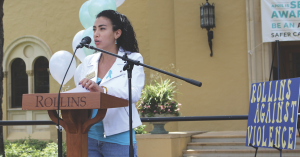 A series of speakers from the Rollins and Winter Park community shared words of encouragement in support of the goals of Sexual Assault Awareness Month. The rally also featured a special guest performer, Aleise Delgado, a local singer and survivor of domestic violence and abuse. Delgado performed a cover of “This is Me” from award-winning feature film The Greatest Showman. Mariem Tabrez ‘18, Vice President of SGA, delivered a call to action for Rollins students. Rev. Shawn Garvey of the First Congregational Church of Winter Park provided pastoral support during the event. Rev. Garvey led the rally in a moment of silence in solidarity with survivors of sexual assault. Rev. Garvey spoke of values to keep in mind during the month, and that people should carry forward in the fight to end sexual assault. “If we extend the love and the divine that resides within each of us outward toward one another in the way in we would desire to receive it, then all we can do is care for one another and the mechanisms and systems of violence would evaporate,” said Rev. Garvey. Rev. Garvey concluded his speech with words of strength and encouragement as survivors and allies continue to seek justice. “If we can continue communally, regardless of our journey and from what path we walk, to come together to work in that endeavor, we will attain justice. We will find peace. And the world will finally be able to live in a state of joy,” said Rev. Garvey. Many student organizations were present, providing educational material and hosting campaign pledges. The Interfraternity Council hosted the White Ribbon campaign pledge, an international movement of men and boys working to end violence against women, while Panhellenic hosted a table providing educational material on consent. The Student-Athlete Advisory Committee hosted a table featuring material on healthy relationships. SGA hosted the “It’s On Us” campaign pledge, a national movement to end sexual assault. Off-campus organizations were included as well, such as Planned Parenthood, the Victim Service Center, and the Harbor House, a domestic abuse shelter. Dr. Mamta Accapadi, vice president of student affairs, also spoke at the event, emphasizing the importance of community when supporting survivors of sexual assault. “Together, we can create a community where survivors of all types are supported and where people are empowered to actively intervene in potentially dangerous situations in order to prevent violence from occurring,” said Accapadi. As the month of April and the year continues, speakers hoped that the words and strength shared at the Rally of Violence will carry forward and inspire change. For anyone who is a survivor of sexual assault, support is available. The Wellness Center provides confidential support through Victim Advocates in Counseling and Psychological Services (CAPS) at (407)-628-6340. For after-hours support, call Campus Safety at (407)-646-2999, and ask to speak with a Victim Advocate. The Office of Title IX is available to discuss options for filing and resolving a report of sexual assault and offers interim measures to protect survivors’ safety and well-being. The Office of Accessibility services will also work with survivors to provide housing accommodations as necessary after an incident of sexual assault.